Since getting a new blender, I have been trying out a whole bunch of smoothie recipes. I have finally found my favourite type of smoothie – and it is green! The thought of putting kale in your drink may sound gross, but the kale picks up the flavour of whatever you blend it with, leaving the healthy benefits of kale along with the flavour of your choice. I’m clearly not following a rigid recipe here to create my green power smoothies, but I definitely recommend trying your own version of a kale smoothie! 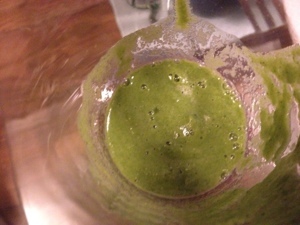 I have also tried spinach, which I did not care for, I find it is much too powerful in taste for a beverage. Let me know if you discover a good combination! Happy blending!